I left Aix-en-Provence in a huge rainstorm that seemed to cover most of France, on a TGV that wouldn’t get to Strasbourg until after midnight. I was pretty happy with what I’d sketched, though sad to leave. Here is a map I have put together showing all the locations in Aix of my sketches; if you click on the map you can see it in bigger format. 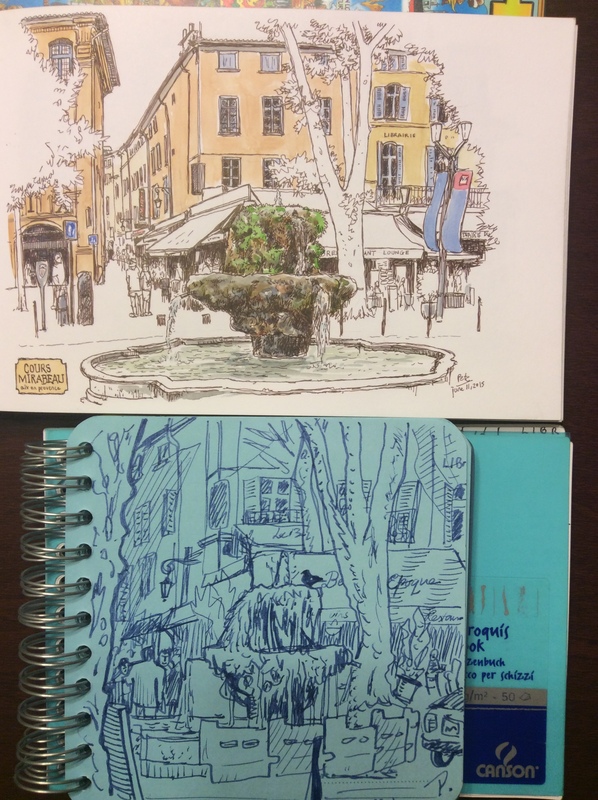 It’s not the first time I’ve drawn a map of Aix, but before I show it to you, I wanted to show you a comparison of some sketches I did about twelve years ago with the same locations as sketched now..
Two sketches of the Fontaine des Neuf Canons, Cours Mirabeau, 2003 and 2015. I liked that blue sketchbook and blue pen at the time (no, it was not my blue period). 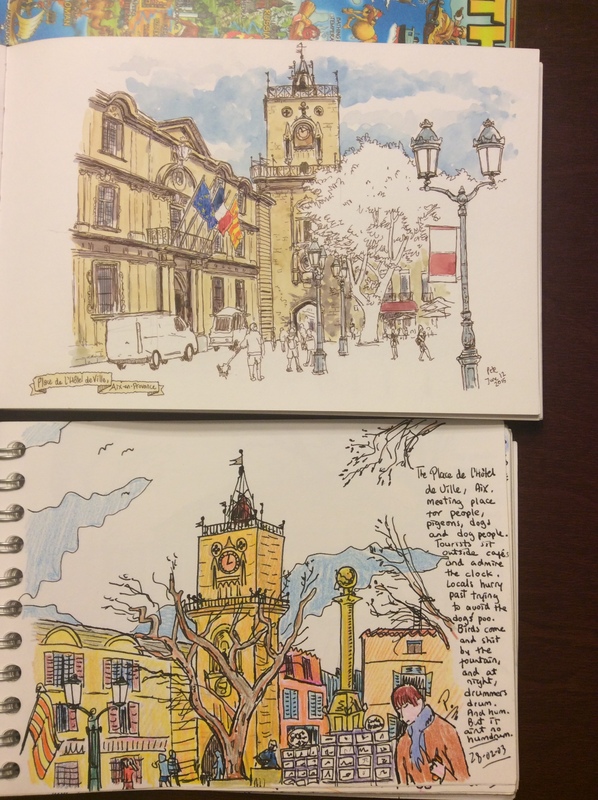 Two sketches of the Place de l’Hotel de Ville, the bottom one from February 2003 in a Canson sketchbook in black pen and coloured pencil, the top one from June 2015 in brown ink and watercolour. 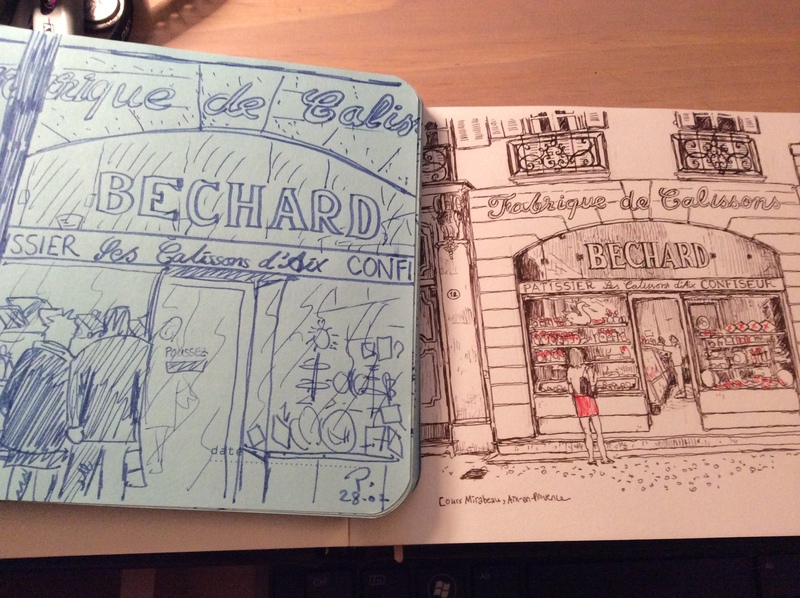 Bechard, the place to buy your Calissons d’Aix on the Cours Mirabeau, 2003 and 2015. What can I say, I was treading old ground. 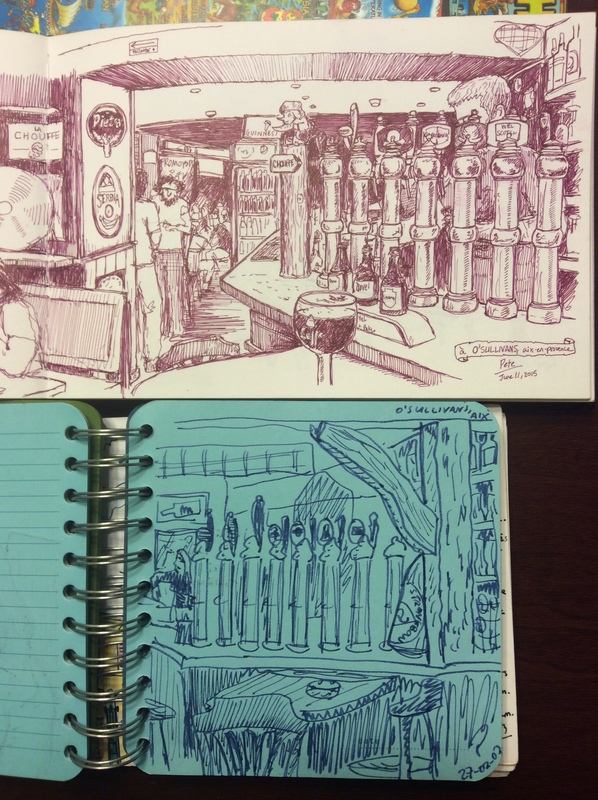 The almost exact same shot of Pub O’Sullivans sketched twelve years apart. I was drinking a Leffe in the 2003 sketch too (I know because I actually sketched it on the next page). I know I have one of the Cathedral from 2002 too which I must dig out and add to this post. It’s interesting to think that my style might have evolved or improved over the years, I’m still drawn to the same subjects. I had actually forgotten I had sketched these before until I came back and looked at the old book again. 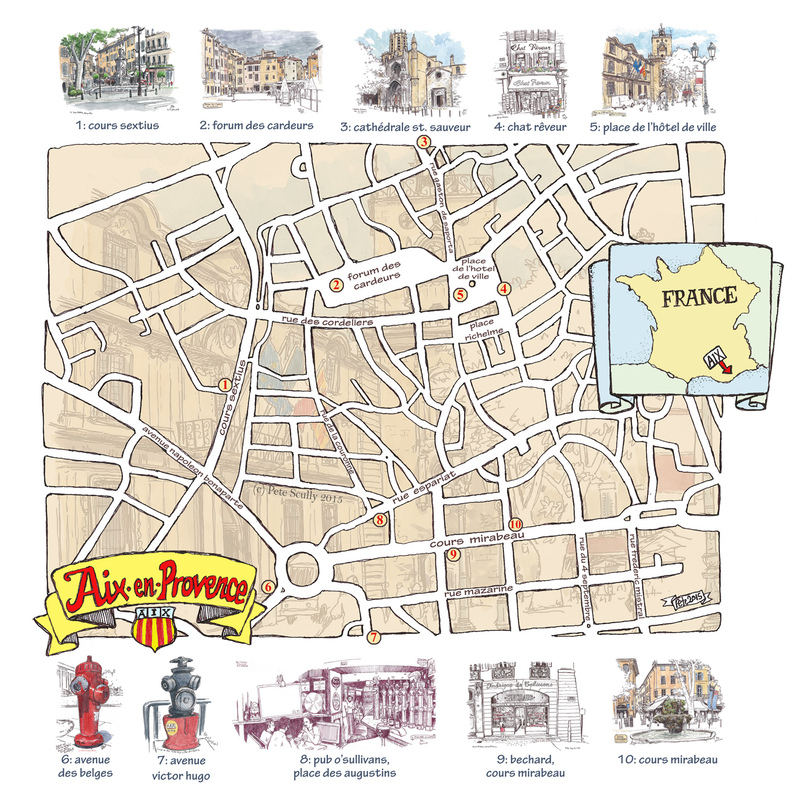 But speaking of things I have drawn before, here is a map of Aix that I drew in 2003 in that Canson book (which I had purchased at Papeterie Michel, on the Cours Mirabeau, my favourite art shop in Aix (and I am pleased to say it is still there). 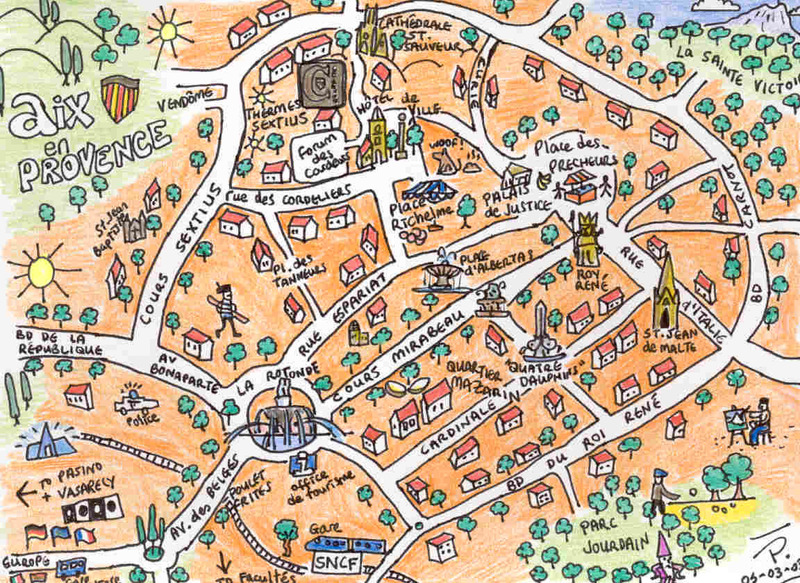 It’s a more cartooony style than I use for my maps now but I love it (even though I spelled Parc Jourdan incorrectly, so it would rhyme with ‘Nain’, as in ‘Nain-de-Jardin’, after a story told to me by a guy called Corentin who said that all the Nains-de-Jardin of Aix came to life and partied here at night. I still believe him, too. 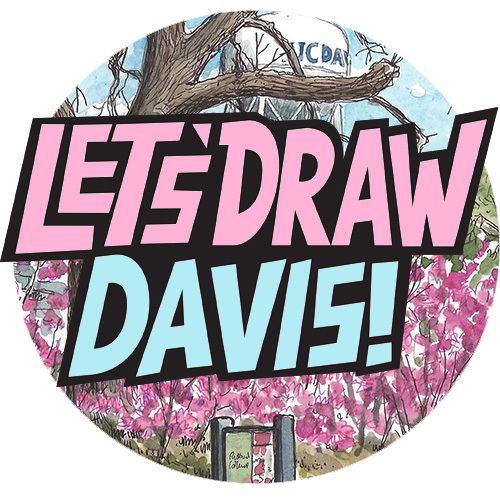 Thanks for posting this – great sketches! I found it fascinating to see the progression of your work over time. Oh for sure – gone are the ten to fifteen minute sketches! I have a clearer idea of what I want from a sketch, but it’s always a journey, never know where it’ll end up. Might get worse. Love to see what they look like in another twelve years!